EyeVerify has released the results of a standards test on its Eyeprint technology that show its eye vein matching technology exceeds industry standards and requirements necessary for deployment. The Biometric Standards, Performance and Assurance (BSPA) Laboratory at Purdue University conducted the tests, collecting eyeprint data from 250 subjects. It found a false acceptance rate of .013 percent. 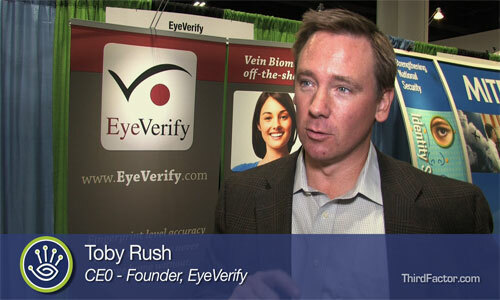 EyeVerify also has received a second pattern for eye matching technology from the U.S. Patent and Trademark Office. After receiving a patent for the concept of eye vein biometrics in 2005, it now has a patent covering the method and features used for pattern matching in the Eyeprint verification system. From March through May, EyeVerify will be running a beta program for mobile security participants to test its technology in conjunction with mobile transaction security. The beta test will include prototype applications, SDK access, technical and engineering support and quality assurance test plans and results.